Harnessing the power of the sun is a wonderful option to help combat pollution and lower your energy costs. When considering a do-it-yourself solution, the options can be limited - and quite complicated. A short list of the pros and cons of DIY solar can be found here, but this article will explore some of the lesser-known pros and cons of a DIY solar project. For simple installations such as solar garden lighting or heating your swimming pool with the power of the sun, there are viable, effective, and affordable DIY options on the market. However, with larger projects, such as whole-house solar, the process requires quite a bit of knowledge of electrical systems. Here are a few things to consider before going forward with your DIY solar project. The majority of solar equipment is produced in China, with only 14 American manufacturers producing solar cell modules, according to a study published by the Brookings Institute in February of this year. However, as the price of solar equipment has been dropping at a rapid rate, the offset of the passed-along trade tax in the form of increased cost to the consumer is predicted to level out by the end of the year. By 2016, the number of solar installations had increased in the United States by 14 times what it was just six years prior, according to the study, lowering the cost of individual solar panels significantly, and that pattern continues through the current time. However, a new tariff on steel and aluminum imports proposed last week may make a bigger impact on American manufacturers, said CNN Money in a recent report. In fact, it is feared it may spark an international trade war which will have impacts on a variety of products, in particular, those made of metal. But solar equipment is relatively insulated from these increases and while there may be temporary fluctuations in prices for solar equipment, the overall effect should be negligible. Across the country, utilities are investing in renewable energy technologies at a rapid pace, based on long-term studies which predict solar panels will continue to become more affordable, according to a top energy policy and legal expert in an opinion published by Forbes. Increased investment in solar generation by utilities will drive the prices of solar equipment down, at the same time that material prices go up. While the net effect is still difficult to predict, the price of solar should ultimately continue to decrease. Regardless of the lowering price of solar equipment, individual solar installations are still quite high, putting it out of reach for some homeowners. While the 30% federal tax credit has been extended for solar installations through 2019, additional rebates offered by local and regional agencies may not be eligible on a DIY project. State by state, the parameters to qualify for rebates vary for energy efficiency and renewable energy rebates. But in many cases, these additional rebates and incentives (in some cases, low-interest loans on renewable energy installations) only apply to qualified contractor-installed projects. A solar installation is a mini-power plant on your roof. It requires knowledge about how to work with DC electricity, wiring, inverters and battery banks. Home solar installations are optimal on rooftops, so there's the danger inherent in working at heights. In many cases, DIY projects are not permitted to be tied into the grid by the local utility, which means if your system is not producing enough electricity, there's no back-up. Many states do not allow DIY electrical systems to begin with. While there may be an initial cost-savings, the disadvantages of DIY solar installations include many factors. The biggest reason most people opt for DIY solar is cost - a professionally-installed system can cost 10-20% more. But overall cost-savings may be eaten up with other concerns. Your whole-house solar project must be completed according to the National Electric Code, and pass state (and/or local) electrical inspections. If you're not familiar with these codes, it's easy to make a mistake which will require an adjustment. Those can be costly. Don't try to save money by buying cheap panels - the financial benefits of your system is inherent on the quality of your panels. Instead of going out to purchase the cheapest thing on the market, compare several local contractor's prices. Average pricing state-by-state varies, too. Do your research, ask questions, and get multiple quotes. This research alone can save you 10-20% and may present you with more options than you are able to get on your own. Another mistake people can make when buying cheap solar panels is thinking a contractor to install these panels can be easily found. In most cases, solar installation contractors will only install the equipment they have worked with in the past. Instead of shopping around for a solar installer to install the panels you purchased, it's better to compare solar installers' recommendations for equipment. You can browse the top 100 solar contractors nationwide for 2019 based on consumer reviews (the top installers for each state are listed on this page, too). By comparing information from several installers and exactly how much you qualify for in incentives by using these contractors, you can make a more informed decision about installing solar for your home. 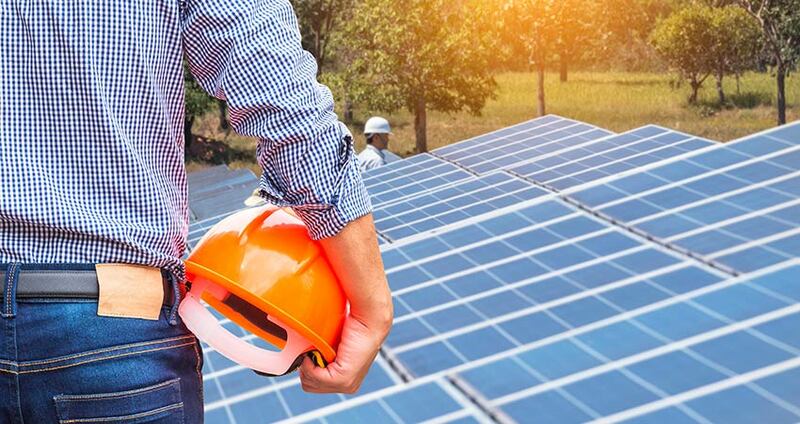 By investigating the options for both DIY and contractor-installed solar power, you can make the best informed decision about your solar installation.